How is a tube cut with another tube? The command to cut a tube with another tube is called "Element contour - rule" and can be found on the "Grid, section, plate, structural element" toolbar, or can be accessed using the "_AstM4CrConByVB ContourNotch" command. The tool will first request the selection of the tube to cut at a reference end, and then the tube at which to cut. 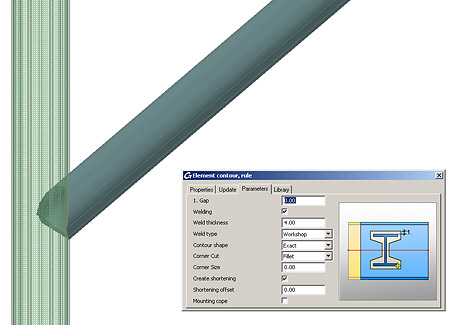 After creating the notch, a joint properties window will appear and allow the user to configure the parameters for the cut. Welds can be added to the connection and the rule can be saved into library.